Do you have a Frozen fan in your household? There are FOUR in ours...that's right WE ALL have the Frozen fever. As a matter of fact, at my daughter's first birthday party this weekend she added a new word to her not quie one year old vocabulary- shouting out 'ELSA!' when she opened her new doll! She is perhaps the biggest (and smallest) Frozen fan around here, but the rest of the family can be found singing the songs as we go throughout our day too. I'll find myself singing 'Love is an Open Door' as I'm doing the dishes and sweeping the floor. My son is guilty of singing 'Let It Go' as he plays his video games...and I wouldn't be surprised to hear that my husband breaks into 'Summer' during the workday! The DVD will be released on DVD and Digital November 18, but you can preorder it NOW. 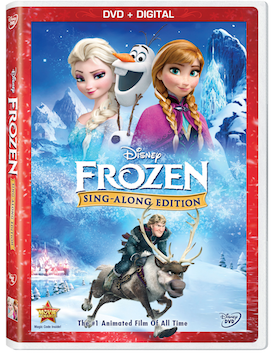 We cannot wait to experience Frozen in a whole new way...and finding this fun version of the film underneath our tree! Do you have a frozen fan in your household? What is their favorite song from the movie? Will you be purchasing this new DVD for them this holiday season? This was a cute movie! This would be an awesome birthday/Christmas gift!